Reaction of isonicotinaldehyde with 2-cyanoacetohydrazide afforded (E)-2-cyano-N'-(pyridin-4-ylmethylene)acetohydrazide (1). Compound 1 was used as the precursor for the synthesis of novel pyridine derivatives by reaction with different arylidene malononitriles, malononitrile and acetylacetone to give pyridine derivatives 5a–e, 6 and 7, respectively. 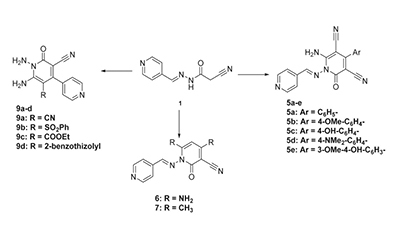 4,4'-Bipyridine derivatives 9a–d were synthesized by a three-component reaction of isonicotinaldehyde, 2-cyanoacetohydrazide and activated nitriles 8a–d. Treatment of compound 9a with different aromatic aldehydes gave [1,2,4]triazolo[1,5-a]pyridine derivatives 11a–c. All reaction products were characterized by analytical and spectral data. For the novel compounds their bioactivity as antitumor agents was examined for in vitro cytotoxicity against HepG-2 and MCF-7. It was found that compounds 9a and 9b have high cytotoxic activity against both HepG-2 and MCF-7.